JPods can be fast where that need is justified. In cities quickness is a critical important factor in "speed". 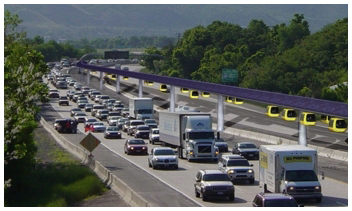 JPods networks are grade separated with vehicle traveling non-stop from origin to destination. It is this removing of the repetitive start-stops that creates both value to the traveler and speed between destinations. JPods will typically travel between 35 and 45 mph, 56 kph and 72. As noted in the graph below, this speed of travel is much faster than drivnig cars in most cities. Cars are the right answer: personal, on-demand access to almost any destination. Cars are just the wrong mass and randomness of behavior for highly repetitive travel. As of 2012, congestion cost the average worker 38 hours per year (source: TTI’s 2012 URBAN MOBILITY REPORT); a work-week per year drained from the person and economy. This number is only expected to increase, as the economy improves. This drain equates to a 2% tax on working people that benefits no one. In large metropolitan areas such as Washington DC, Los Angeles, and San Francisco the cost is nearly double. Commuting to work by bus takes about twice as long as by car. Delays are a tax on time. JPods combine the personal service of a chauffeured car with the process controls and automation of the Internet. JPods provide the personal mobility of a car without the requirement to park or operate it.